I found it so hard to write this post, I actually put it off for some time. In the end I decided I couldn’t write it and this experience was best written by my partner in crime, the ever articulate and incredibly handsome: Mr. Josh. A Gentle Introdution: I recognize this post may be a bit controversial due to the negative media coverage of tiger sanctuaries in Thailand, and this one in particular. So before you write a comment at the bottom of the page about your opinions, please read the full post to see our experience. There are always 2 sides to any story, so it’s important you don’t get a 1-sided, malicious, misguided message. I do get a bit miffed when someone sitting in front a computer thousands of miles away who never visited a tiger sanctuary like this, has such strong opinions that are based on half-truths (or outright lies) from other people who write about the topic and had never even been there themselves. What I’m writing about is our first-hand experience. We were picked up from our apartment by Lily who worked for Tour With Tong, She was very friendly and informative. We were the only guests on the private tour so we had van to ourselves. With a 2 hour drive to our first pitstop, and plenty of room stretch out, we caught up on some missed sleep. Our first stop was the bridge over the River Kwai (Khwae Yai), which the famous WWII movie is based on, albeit a partially fictional story. Plaques near the bridge commemorate the thousands lives that were lost during the construction of the railway from Thailand to Burma which was a key part of the planned land invasion of India by the Imperial Japanese. It was a very somber stop on the way to the Tiger Temple, but since we love history, this was a memorable part of the trip. While we briefly walked over the bridge, Lily headed to some nearby shops to purchase breakfast for the monks. From there we continued onto the Tiger Temple. When we arrived there was a volunteer staff member of the monastery directing visitors where to sit at the front entrance to the property in preparation for the monks arrival. After a short wait the monks arrived and filed past our tables and we gave them a special bow of respect and handed a portion of food that they accepted, it would be their only meal that day. There were about 20 visitors in total. It was a very humbling experience to serve these devout men. Next we walked through the entrance to the main temple where the monks sat for morning prayers. Several tiger cubs were already there, with the larger ones chained to walls (for safety) and a couple tiny cubs were being cared for by staff. 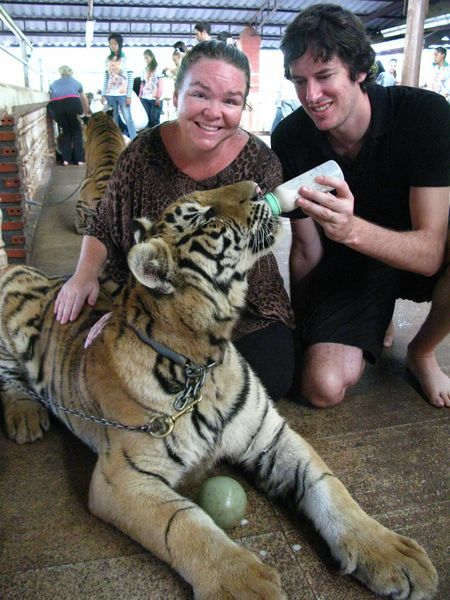 While listening to the monks chanting we had the opportunity to pet the baby tigers and also feed them milk from the bottle. Being our first interaction up close with a real tiger, we were initially a little apprehensive but quickly realized how similar they were to domestic cats (just with bigger teeth and claws). The tigers showed no aggression and were actually very friendly. Erin got the chance to cuddle a napping cub as well as hold a small 6-week old with big puppy dog eyes. Well, more like kitty cat eyes, but that doesn’t sound quite right. After the prayers the monks ate their meal followed by the visitors who were able to share some of the food that was brought for the monks. This was laid out on a table in the original plastic bags the food was packed in so we just grabbed one parcel along with a drink and sat down to eat. It was a little strange for us to eat a curry dish for breakfast, but it was still tasty. It was around 9am by this point, so it felt more like lunch than breakfast since we had been awake for over 5hrs. After the food was cleaned up the visitor group was lead down the stairs of the main temple and waited for several staff to bring down a handful of tigers to take for a walk. We were given very specific safety instructions and grouped into 3 pairs with other visitors, then shared turns in taking the big cats for a walk around the grounds. 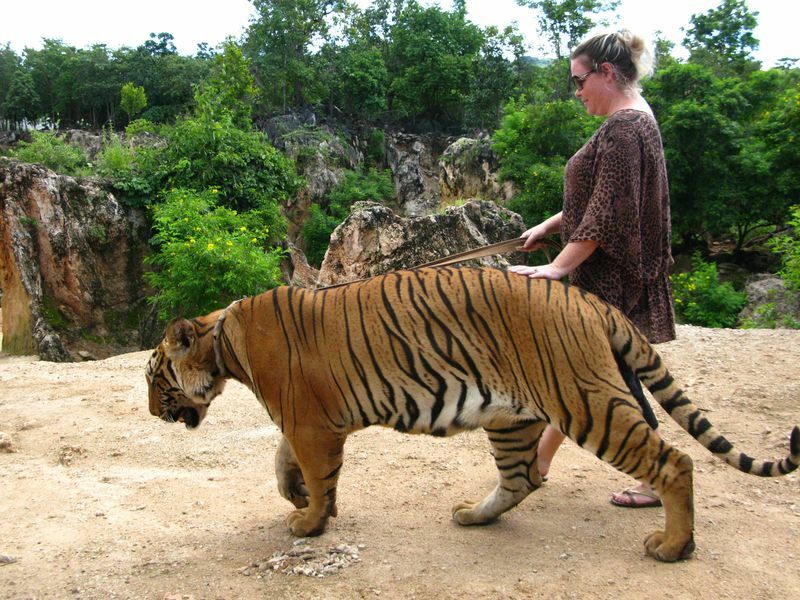 There was always a trained handler with each big cat at all times, and we didn’t feel unsafe at any point, although it felt a bit surreal having a tiger at the end of a leather leash with my hand on the other end. Having taken my pet dog for many walks in the past, this was very similar just with more pulling power. The tigers were walked towards the large enclosure where the staff chained them to an anchor point on the ground. 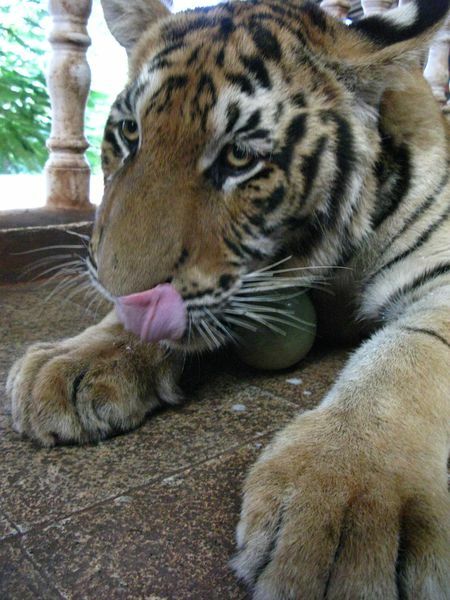 Once secured, visitors were given the chance to feed cooked chicken to their nominated tiger. The animals are not fed any raw meat and appeared to be well fed. 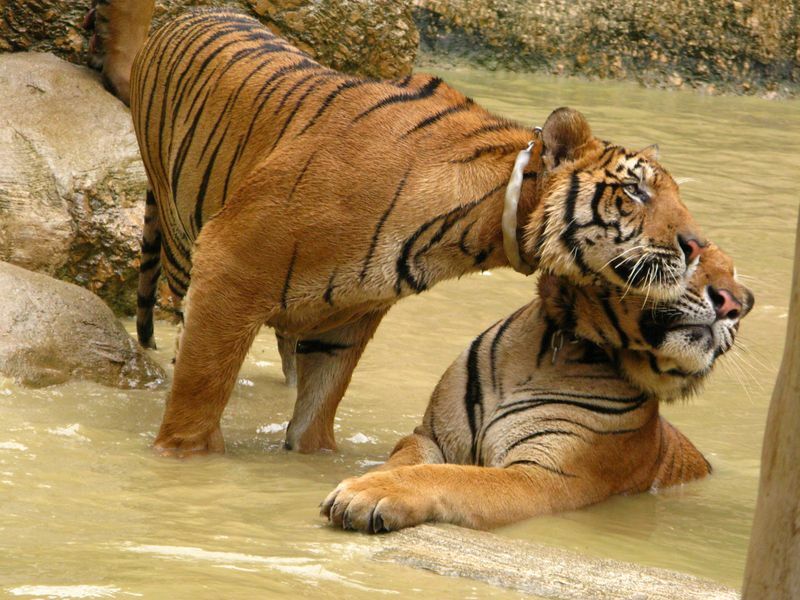 Once the tigers were content they had their morning bath, which involved a bucket with soap suds and a garden hose. They really seemed to enjoy that, considering the common perception that cats don’t like water. Next on the schedule, handlers guided the big cats into a large enclosure and participating visitors. We were handed cat “toys” which were plastic bottles or bags attached to a long stick. Again, safety instructions were very carefully delivered. 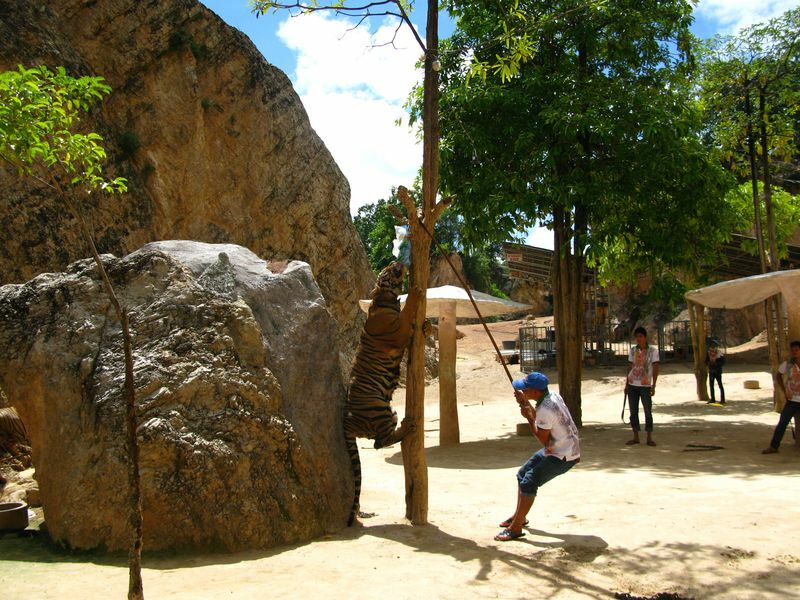 Visitors were lined up against a tall wall and held out the toys while the tigers were brought into the enclosure. There were a number of handlers keeping a close eye on the tigers and making sure the visitors didn’t feel unsafe. After a few moments of shaking the noisy toy, a large tiger tried swiping it with his giant paw. I was a bit slow on the draw and he won that point by knocking the stick out of my hands. The games continued for about 20 minutes. This portion of the tour has drawn plenty of criticism from animal welfare groups. Having experienced this first-hand I can confidently say that the animals were not being teased. Anyone with a pet dog or cat would know how much they enjoy the mental and physical stimulation of playing with animal-appropriate toys. This was no exception. The handlers kept the tigers at a safe distance and when they appeared to get a little too close, the handler stepped in the way of the visitor and gently guided the animal back to a safer distance so there was no real threat. It was amazing to see the animals so active at such a close distance and how they interacted with each other. Once the tigers had enough play time, we were guided outside the enclosure to the next area where we took photos with the larger tigers as they rested in the shade. They seemed pretty docile and content just lying there. 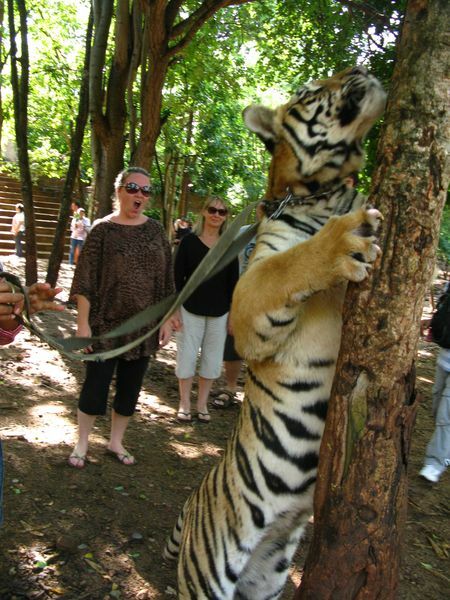 One of the accusations about the temple is that they drug the tigers to sedate them. I saw absolutely no evidence of that. My guess is this incorrect assumption stems from the fact the some visitors may not understand that in the wild tigers sleep for 18-20 hours per day. So the fact that they are not bouncing off the walls all day is perfectly normal and natural. It doesn’t imply anything underhanded is going on. 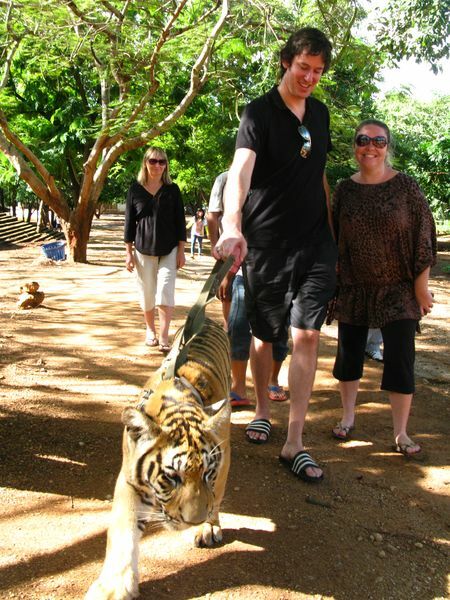 We walked the larger tigers to the play area once all the visitors had the chance to take plenty of photos. This consisted of a pond with an island inside a steep quarry to keep the tigers contained. The visitors were placed into a secured pen made of wired fencing. This gave us close access as the tigers played while maintaining safety. Throughout the whole day the staff and handlers were very mindful of safety. This playtime gave the larger tigers the chance to cool off and play with each other as well as interacting with the handlers. 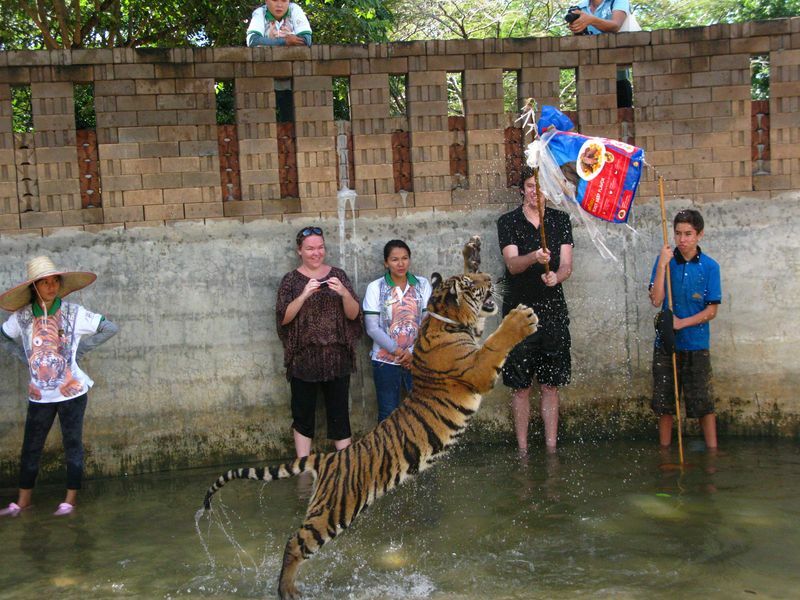 There were some incredible moments watching a full-grown tiger leaping into the air to reach a toy and landing with a great big splash into the water. Watching the tigers interact with each other was also amazing. After about 30-40 minutes of watching we were coming up to the end of our visit. There was an optional afternoon session, but we were worn out by this stage and getting very hungry. I wanted to point out a bit of the history about the tiger temple that may not get much publicity. The monastery was started in 1994 as a sanctuary for a number of different types of animals. The first tiger cubs were brought in by local villagers in 1999 who had found the animals after their mothers were killed by poachers. The majority of the tigers at the temple have been born there in the last 5 years and at the time we visited in 2012 there were around 110 tigers. The growth in numbers is due to a successful breeding and conservation program. 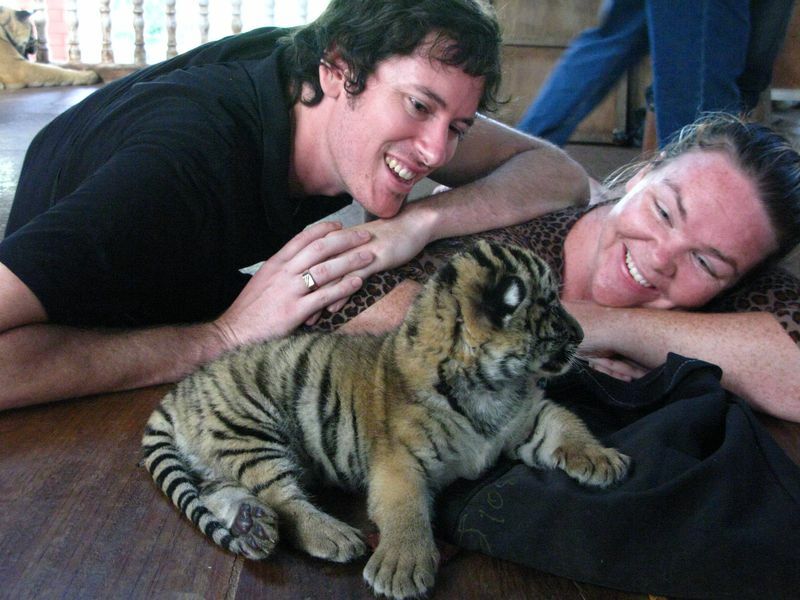 All the money raised by the tours goes towards looking after the tigers: paying for medicine, food, veterinary care, etc. 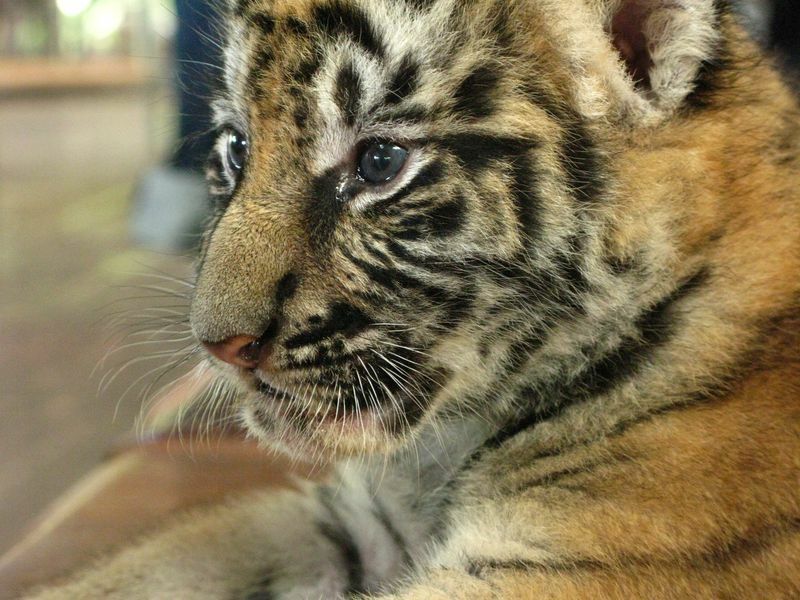 The eventual goal is to breed tigers for later releasing back into the wild. I’ve visited internationally recognized zoos that don’t look after their animals as well as this place does. After we left the Tiger Temple, Lily took us to a scheduled lunch at a nearby restaurant. On the way to the restaurant we stopped by the side of the road in an area that was known as a gathering place for wild monkeys. Lily had brought along peanuts that we could feed to the monkeys. And unlike our experience at the Monkey Temple in Ubud, Bali or those scary monkeys at Batu Caves in Kuala Lumpur, these monkeys were actually very friendly and not aggressive at all. They ate the peanuts out of our hands. A nice little bonus side-trip. Once we reached the restaurant, we relaxed for an hour or so and enjoyed the delicious Thai food. Without a doubt, Thai is one of our favourite cuisines. The final stop of the day was the Elephant Sanctuary. 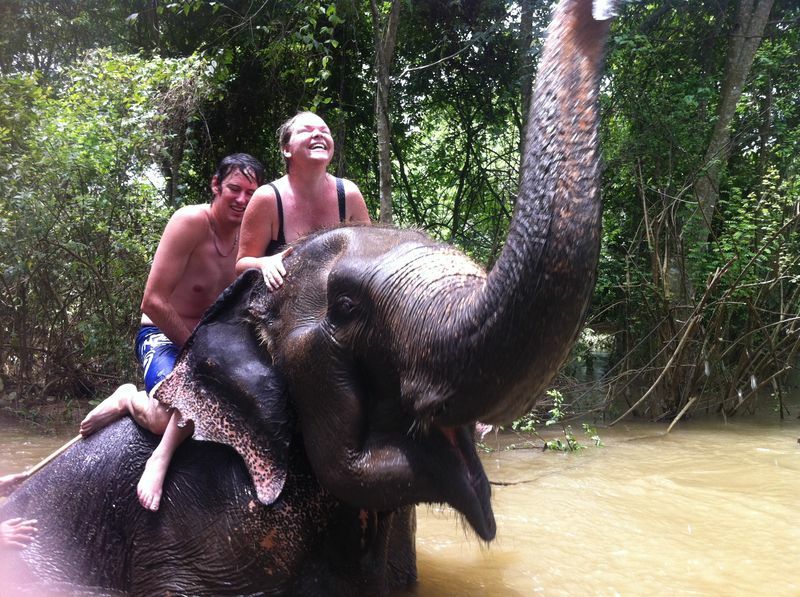 We had experienced elephant rides in Malaysia and Phuket in the past, but this was definitely our favourite. It wasn’t busy or crowded and the elephants looked like they were well-treated. 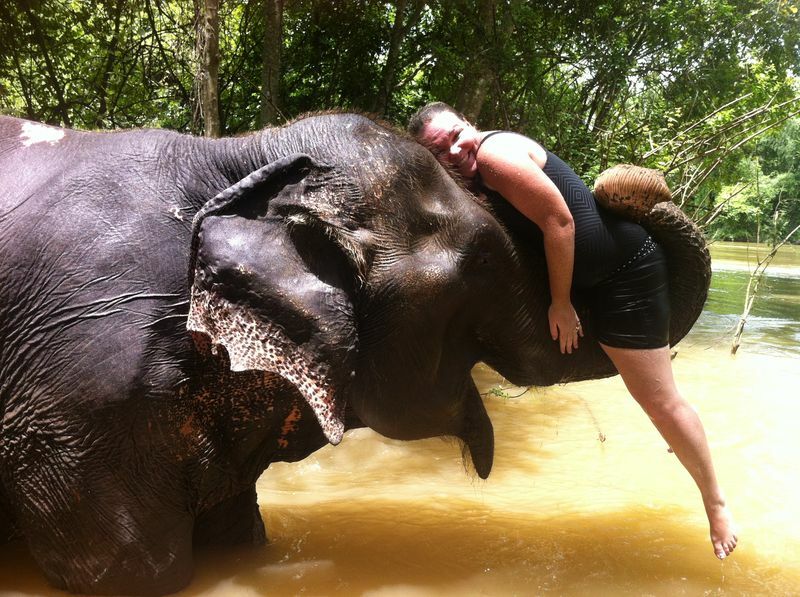 Full Moon was the name of our elephant and we walked with her to the river where we had a water fight. It was a lot of fun, albeit a 1-sided battle that we had no chance of winning. 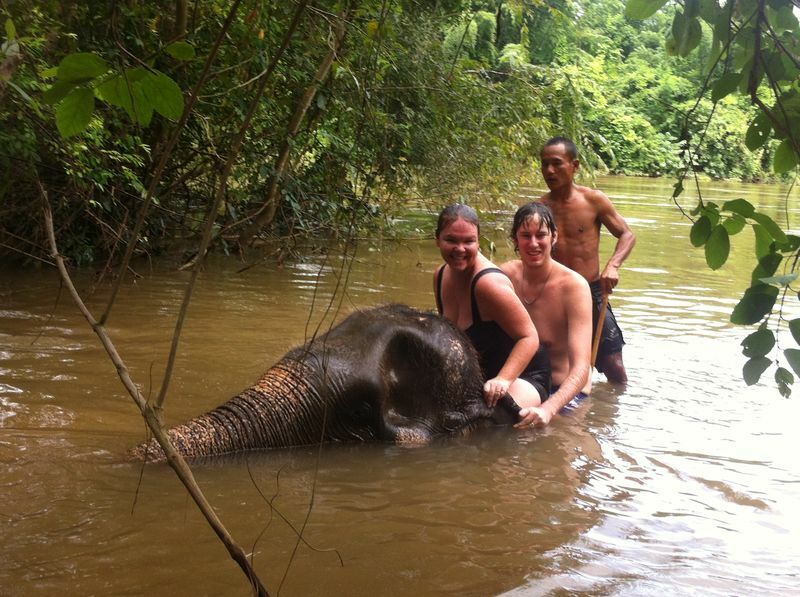 After several photos we were able to ride the elephant back to the starting point bare back. 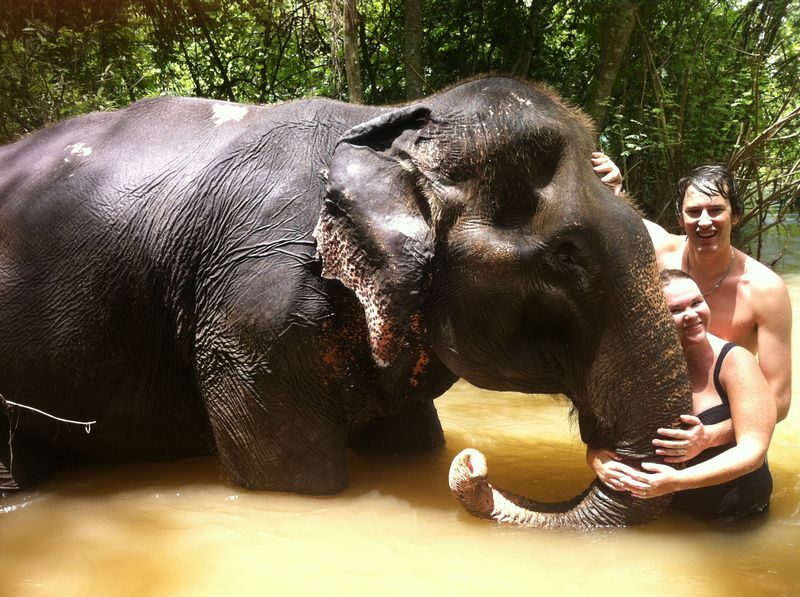 This was a first for us and the gentle giant was very friendly. We rewarded her with tasty bananas that she swallowed whole. It was another 2.5hr drive home to Bangkok and we were completely exhausted. The whole trip cost us around $500 in total for 2 adults, which included lunch and breakfast. While that isn’t cheap if you’re travelling on a tight budget, it is definitely a once-in-a-lifetime experience and worth spending the money on. We understand the concerns people raise for the animals, but it was our experience that these tigers are better off being cared for by these Buddhist monks than chained as a pet in a village or being poached in the wild. If we had any doubts we would not have supported the activity at all. 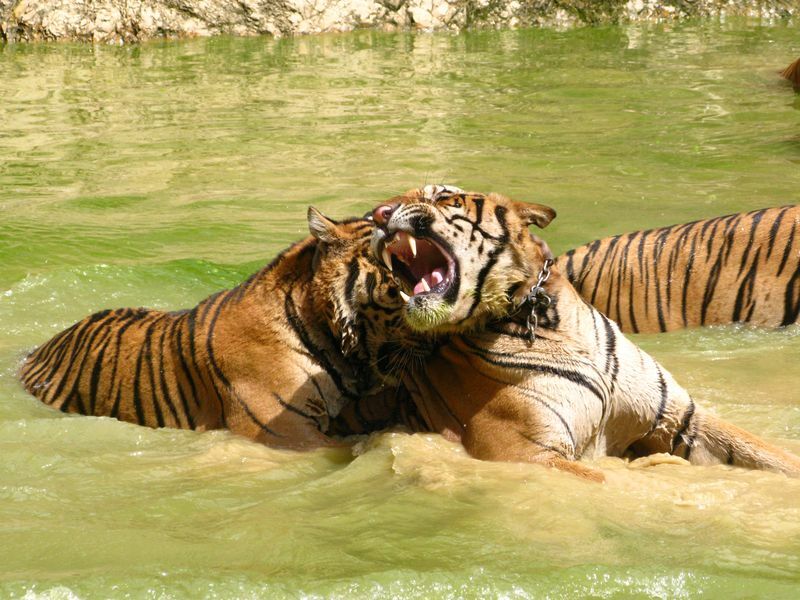 So you have our take and you can decide for yourself, but if you are in love with these beautiful creatures then I can definitely recommend taking a Tour with Tong to see Thailand’s Tiger Temple. While we have used some great photos here, there are so many. You can see all of our Tiger photos here in our Photo Journal. And the elephant ones here. We have a few of these great tiger photos available to download in our FREE Desktop Wallpapers page. Enjoy! Perhaps you would like to read about the other side of the story? Click here for a differing view from Care for the Wild. I really appreciate you posting this Erin and Josh. 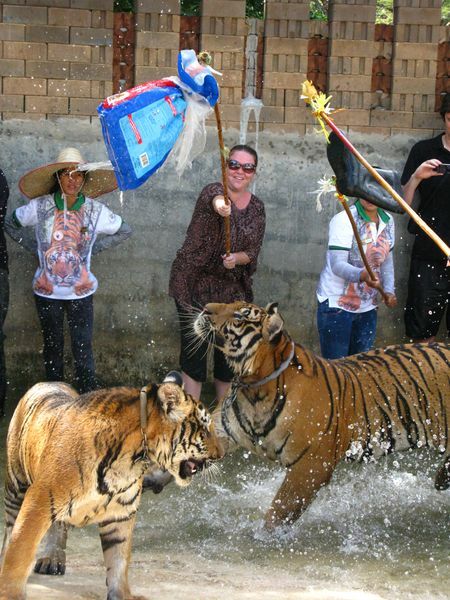 My initial instinct would be to stay away, I've seen plenty of drugged, abused, tigers in Thailand and elsewhere. But this does, indeed, look different. Wow sounds amazing. Nice to hear that they are looked after, much better than being poached! Thanks for writing! Wow wow wow!!!! 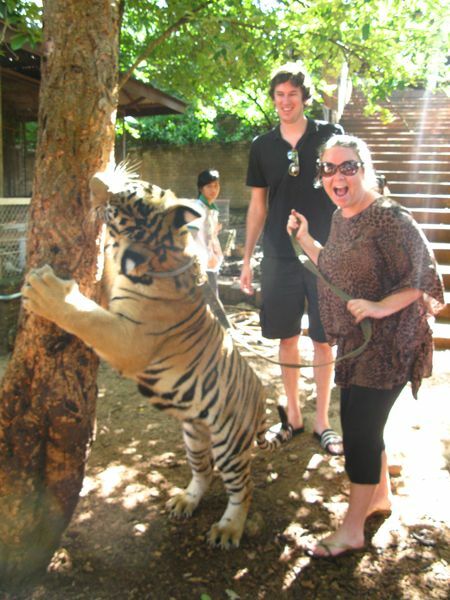 I was nervous looking at u in photos with the big tigers... Don't think I could do it!!! But love the baby tigers, monkeys and elephants! How amazing! God is so amazing creating such beautiful animals!!! awesome, definitely going to visit when we are in Thailand next! great read and pics, they are beautiful animals. Looks like you had a very positive experience. We visited a 'tiger temple' in 2007 near kanchanaburi but I don't recognise it from your pictures so either it's a different place or it has been overhauled since. Unfortunately our experience of how we and the tigers were treated on our visit was not so pleasant. Glad to see things have moved along since then. I loved reading this! I did the exact same day trip in 2012, also with Lily! and had the most amazing day. The animals were so well treated, very well loved. The 'secluded restaurant' that you mention going to between the tigers and elephants, we had the most amazing lunch here, I'm sure it is a place I will never come across again, but wow. amazing food! You're braver than me! You even wore leopard print!!!! We loved Kanchanaburi but didn't make it to the Tiger Temple. I live this post, we did the same tour with Tong (with another guide) and had a fabulous time! We saw no abuse and find it annoyig that people rant on about what a horrible place it is because they A. haven't been or b have been for 5 mins in the afternoon when its is the hottest and the tigers are at their laziest! We are all for caring for animals and there is abuse everywhere, but we didnt see any here. Wow! That is an experience you will never forget. 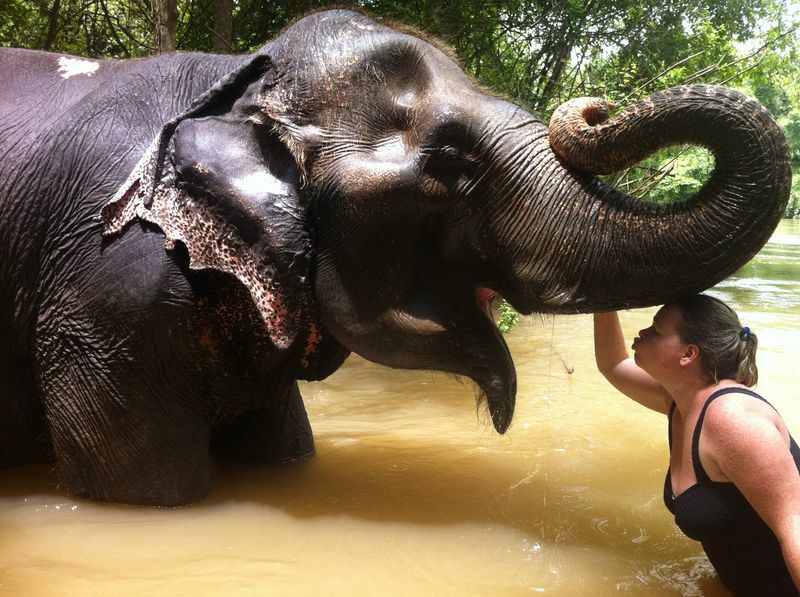 How amazing to touch and interact with these large animals. From your description the shelters look well organised and the animals well cared for. Hopefully with tourists paying money to see 'live" animals the poaching will have largely stopped. love these photos of you. i don't know if i'd ever do something like this but it's great to see you doing it and having so much fun. We had the same experience when we were in Kanchanburri in July. We were on a brief whirlwind tour of Thailand during the NZ school holidays, and went with a group, which had prebooked this as part of itinerary - not the way I usually like to travel, but a nice getaway in the middle of the year that didn't involve much thinking after one of the busiest terms at school. We walked the tigers, then did the exercise program where we fed and bathed them, and then played in the water with them. After listening to the guide explain the tigers daily routine, it made sense to us that they'd be tired in the hot afternoons. They also told us that only the males were able to be out and pet/have photos, because after they'd been exercised and fed, all they wanted to do was sleep. I believed it and drugging had never occurred to me... I was also convinced that I wanted to return and volunteer/live with the monks. Then when I got home, I read all sorts of different articles about the Tiger Kingdom, and was suddenly conflicted. I didn't know who or what to believe anymore. I didn't want to support any kind of animal abuse and I felt guilty for not having done my homework prior to. I still cherish the unique experience, thanks for sharing yours! Great post, I enjoyed it. 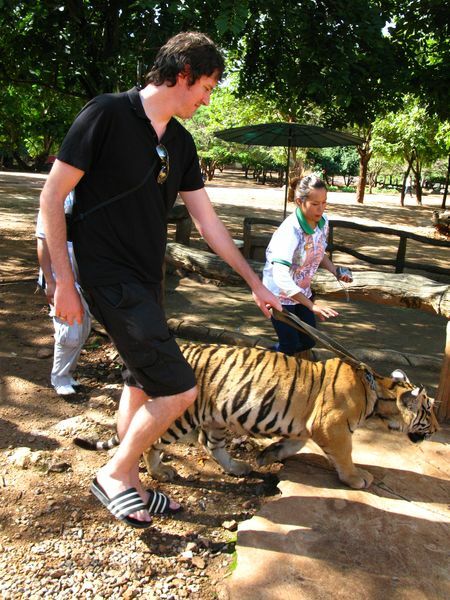 sitting with Tiger, playing with Tiger is something incredible, I would like to experience that as well someday soon as your post have increased my curiosity about this place in Thailand. Thank you for showing both sides of the story. 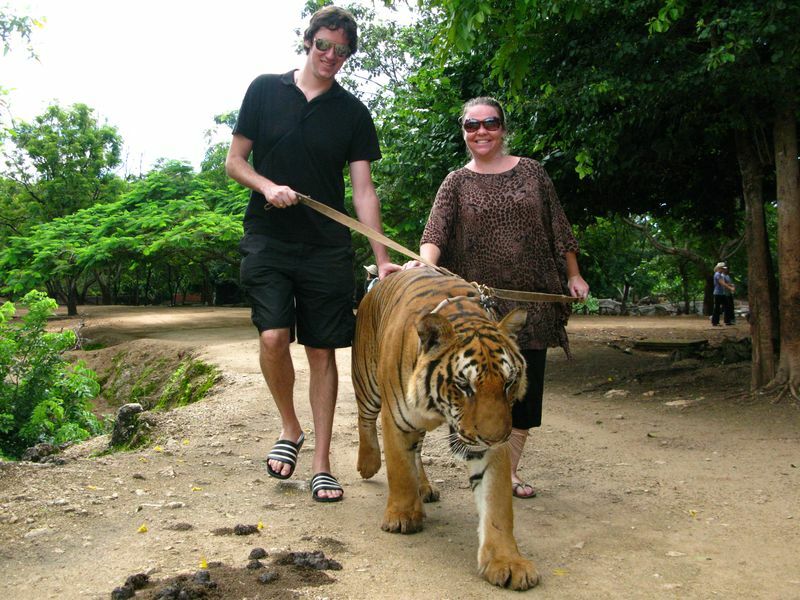 As for me, I still believe that Tiger Temple is really nothing more than a money-making scheme. 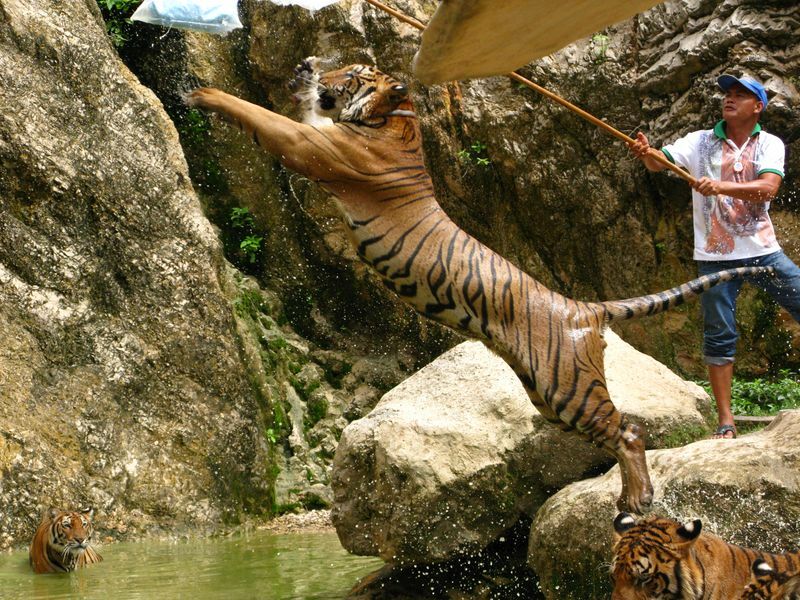 I really recommend that anyone interested in Tiger Temple read the report from Care For The Wild. 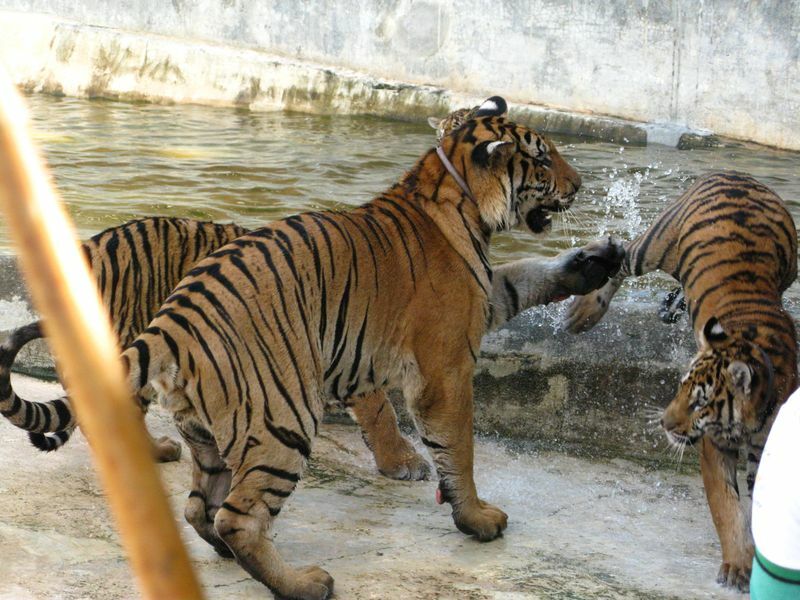 They recently visited the temple and noted that many of the tigers appeared to be visibly uncomfortable, and that none of the animals have ever been released into the wild. They've also had ties to illegal wildlife traffickers, which isn't something I'd ever risk possibly supporting. 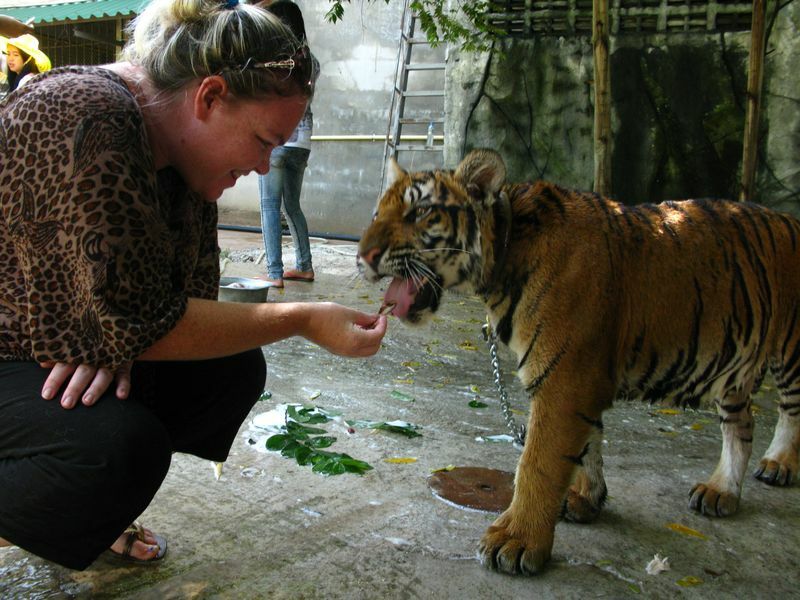 I first visited the Tiger Temple in 2006, it was an unforgettable experience and I have no regrets in going. 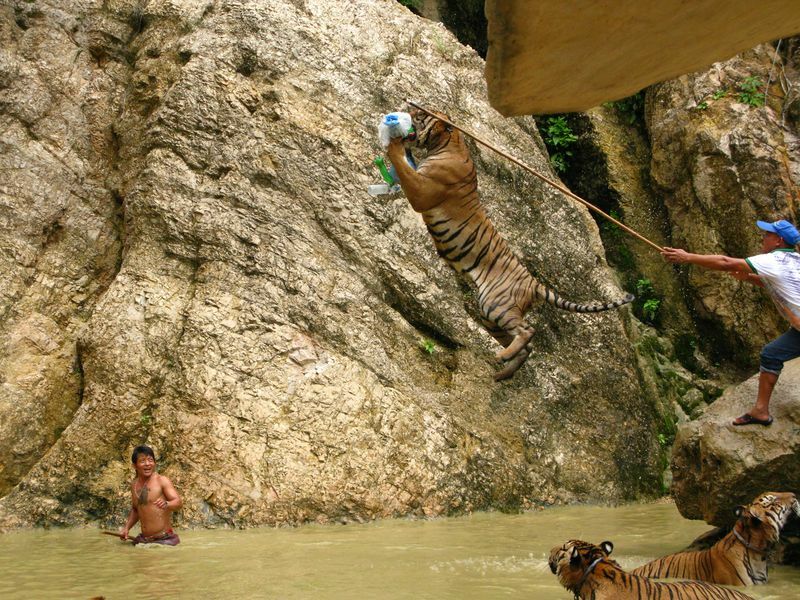 At that time I was only able to witness the tigers in the canyon, each one was chained up and was provided with a water bowl. 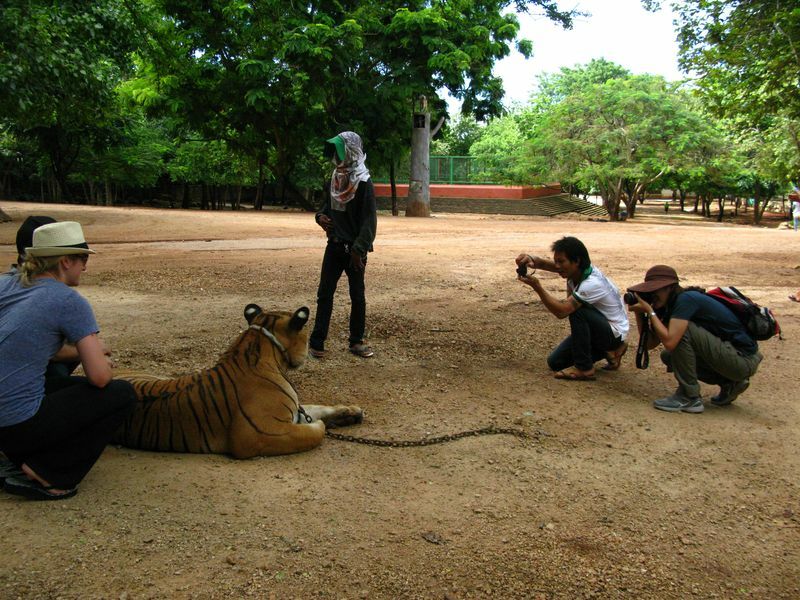 Tourists were led by the hand to have photos with the various tigers. I can certainly attest to the tigers not being drugged, just before it was my turn to have photos it started to rain heavily, all of the tigers got very excited and playful, we were not allowed to approach them until the rain had passed and they had once again be settled. I don't believe that animals who are drugged would have behaved in this way. I will return to the tiger temple this October and plan to take part in the tiger cub feeding program, I cant wait as I love these majestic creatures. If I thought for one minute that they were being mistreated I wouldn't go. I have volunteered there twice and it is improving dramatically, they have had some issues with staff in the past, but most of the money now is being spend on a new Tiger Island which they are building to let the tigers roam around on. The head monk is doing all he can for the tigers and even studied up more recently on how to deal with tigers correctly. He has devoted his life to it, he admits he is not perfect as he has to balance the income and money to feed the tigers massive diet and build better facilities for it. 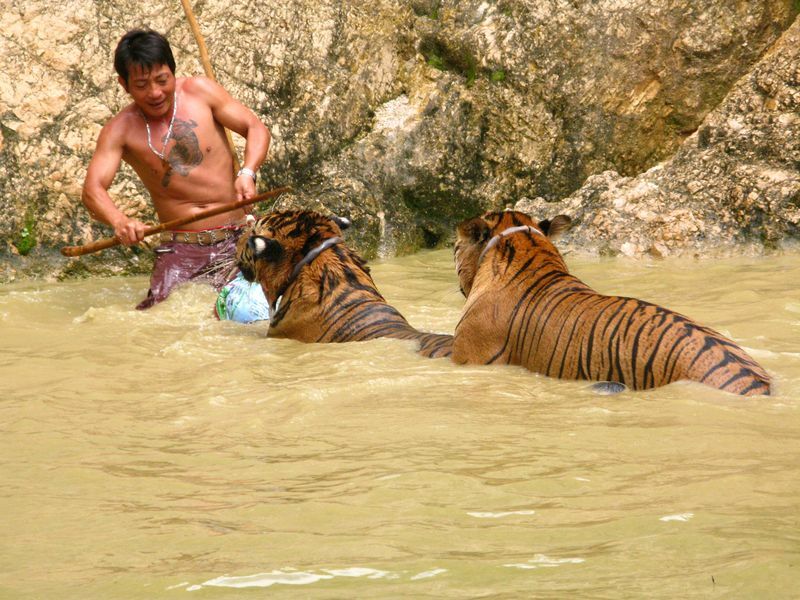 I think the tiger temple is turning around to become a great place for the tigers.